Commissioner Ahmed Tholal represented the Human Rights Commission Maldives (HRCM) at yesterday’s UNDP “Did You Know?” event at the Surf Point, the second in a campaign begun last year. The event targeted awareness building on human rights and the judicial system, particularly as provided in Chapter Two of the constitution. Over a dozen groups including Police Services, the Faculty of Shari’ah Law, Employment Tribunal, Courts, and the Elections Commission offered pamphlets and demonstrations of their social purpose. Many groups interviewed said raising awareness of civil rights and how to exercise them was their biggest challenge. She noted that though many citizens are unfamiliar with case filing procedures, the court had seen a “dramatic increase” in the number of cases filed and expected the trend to continue. Across the square, Police Integrity Commission (PIC) member Dr. Hala Hameed also reported a rising case rate. While many booths provided hard information about social services, several catered to the younger generations. Kids were invited to decorate cakes and paint pictures for various causes. At Care Society, children learned sign language from a hearing impaired instructor and familiarized themselves with disability icons over a board game. “There is still a fair amount of people who don’t understand the nature of various disabilities and how to interact with those individuals. It’s something that needs to be corrected,” she said. HRCM Commissioner Tholal said social reform goes deeper than a pamphlet. Attributing misconceptions of human rights to social instability, Tholal observed that “There’s this idea that if a prisoner has rights, it’s at someone else’s expense. But human rights are not about protecting one person’s rights and not another’s. According to Tholal, the HRCM has been targeted by proponents of Islamic fundamentalists, but the larger Islamic community has supported the commission’s work. Tholal did not wish to comment on the UN Human Rights Commissioner’s recent critique of the constitution’s provisions for flogging and mono-religious practice. Calling for a more concerted media effort, Tholal said media is one of the most important factors for establishing a stable human rights framework. He criticised local media outlets for endorsing only a fraction of the rights issue. Earlier this year, a UNDP study found that gender equality is an area of development in which the country is lagging behind most. HRCM will hold a media training program later this year. Aminath said the next phase of the campaign training approximately 10 NGOs across the country to providing information on the judicial system to islanders year-round. A UNDP report earlier this year found that although the civil society sector is impressive in size, it lacks efficiency and organisation. Aminath said collaborating with NGOs would support both the campaign’s purpose and the NGOs’ interest in capacity building. Aminath said islanders are often aware of their rights, but that Maldivian culture is not traditionally litigal. “People are used to talking and solving the problems that way. Going to court is a process, and if you appeal you have to go Male’ which takes time and money. There needs to be someone in the islands telling people how they can proceed with a complaint,” she said. Plans to develop a mobile high court are indefinite. This year’s event was widely attended by families and youth who enjoyed the activities, free candy, and social milling. Most booths were hosted either fully or in part by young people eagerly offering pamphlets. Aminath said the UN strives to involve youth in most activities, and that they are the backbone to the “Did You Know?” campaign. At UNDP’s Democracy Day ceremony earlier this year, a study observed that youth in civil society were widely recognised as a key factor for democratic growth in the Maldives. Currently, youth ages 18 to 25 comprise nearly half of the country’s population. The first Maldives’ Special Sports Festival was held today at the Henveiru Football Ground, sponsored by Care Society and telecommunications company Dhiraagu. The event is part of Dhiraagu Anniversary Celebrations. 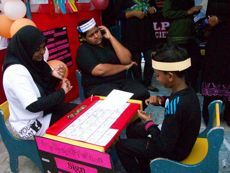 Students from Care Development Center (CDC), Jamaluddheen School (JS), Imaadhudheen School (IS), and Maldives Deaf Association (MDA) are expected to participate in group relays and races. Officials anticipate welcoming 700 spectators to the event, scheduled for 4 to 6 pm today. CDC was implemented by Care Society in 2001, and presently supports 51 disabled students directly to develop skills in communication, living, academics, crafts and behavioral issues. CDC and Dhiraagu have designed the Special Sports Festival as an annual event to support the disabled community by fostering community awareness and integration. Hundreds turned out yesterday for the Maldives Surfing Entertainment Surf Show near the tsunami memorial, perusing merchandise by day and dancing to music by local and guest DJs late into the night. The event, which runs September 16 and 17, was organised by Maldives Surfing Entertainment. Sport clothing companies Sea Sports, Sony Sports, and Round-Up displayed their wares in tents evoking the minimalist surf shack atmosphere. Maldives Surfing Association Event Organiser Mohamed Shabeen was optimistic about the event, which is the first in an annual series of surf shows. “The goal was to raise awareness of surfing culture. Surfing has been picking up lately, more young people are coming out and we have had good feedback on the show so far,” said Shabeen. Shabeen said that local groups were supportive of the initiative. “This wall you see here is not normally allowed, but we were allowed to build it for the event,” he said, pointing at the wooden barrier that demarcates the area as a festival space. Set-up for the event was done by approximately 40 local surfers over three days, said Shabeen. 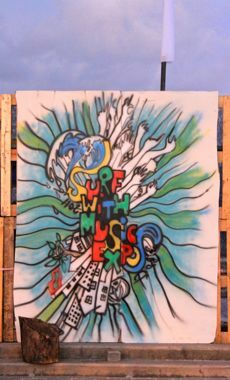 The set-up includes surf board displays, plant decorations, and a light and sound system for the evening concerts. 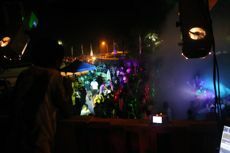 DJs and staff noted that this is the first time an outdoor rave has been held on Male in some time, and said most parties take place on a smaller, more subdued scale. Others suggested that religious conservatism on Male’ has kept the youth from celebrating in public, and said they hoped that events such as the surf show would be held more often. The event was organised by Maldives Surf Entertainment Director and Surf Guide Ahmed Azniel. Shabeen said he hopes this weekend’s surf will garner attention for a surfing contest to be held in November at South Foahmulaku, in honor of the 17th South Asian Association for Regional Cooperation (SAARC) summit.